***CURRENT LEAD TIME IS 14 DAYS AFTER ORDER DATE TO SHIP YOUR HEAD. $295 CORE CHARGE APPLIES. *** Looking for a complete performance cast iron head that is ready to bolt on, right out of the box? This is the head for you. This fully ported, blueprinted head is assembled with one of our very own dyno developed cams for unparalleled performance. Included along with the cam is our complete "top end kit" featuring our stainless steel valves, matched springs, matched chromoly retainers, roller followers, performance HLA's (clearances set up by us), all seals and hardware making this head truly a bolt-on and go right out of the box. Choose from cam and lifter options below. **UPDATE 1-25-19** PAC Beehive valve springs installed standard with head package. These springs yeild 150# on the seat and 350# open. The lightweight and higher pressure Beehive springs extend RPM range up to 7500+ rpm. 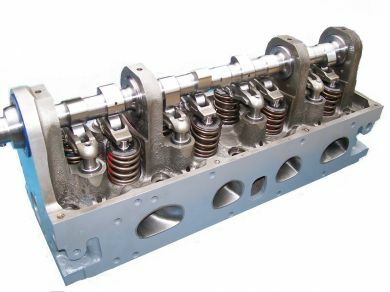 For 8000+ rpm applications we recommend our solid lifter option which includes higher pressure solid roller valve springs, solid lifter kit, additional head machining for solid lifter conversion and the installation of cam tower straps.